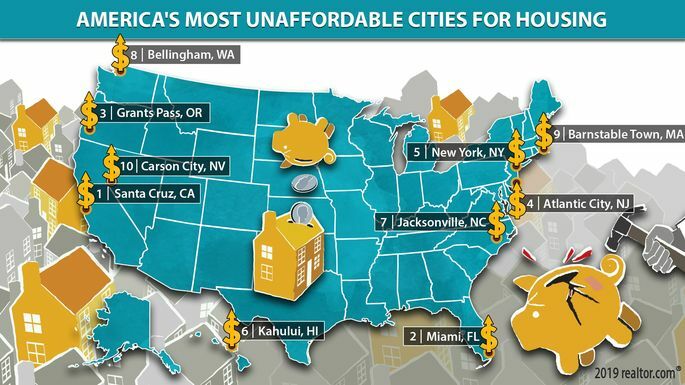 Least Affordable Markets in the U.S.
A new study analyzes housing affordability by measuring the gap between what metro residents are earning versus what they are spending on housing costs. Out of the 500 U.S. metros studied by Realtor.com, the ones with the worst affordability typically had low local wages, not enough job opportunities, a lot of retirees with lower incomes or lots of savings, or non-local buyers with more money. Santa Cruz, Calif. topped the list with a median list price of $895,800, median monthly housing cost of $1,840, median household income of $73,663, and a 30 percent share of income going toward those housing costs. After clawing our way out of a terrible recession, Americans are finally working and getting raises again. But please, hold the applause. Finding a job these days is the easy part. But scoring one that pays enough to cover the monthly rent or mortgage bill with enough left over for everything else is a big challenge for many folks. And it's getting worse. Home list prices have jumped 41.7 percent over the past decade, while median incomes have climbed just 23.8 percent during the same period. That's resulted in plenty of places across the nation becoming unaffordable for the folks who have long lived there.